Inventory We are a resale marketplace, not a box office or venue. Ticket prices may exceed face value. This site is not owned by Pikes Peak Center . Pikes Peak Center for the Performing Arts is 2,000-seat concert hall that provides intimate experiences for patrons. The Pikes Peak Center box office is located at 190 S. Cascade Ave in downtown Colorado Springs, Colorado. The theater opened in 1982 and has four different seating options in the orchestra, loge, mezzanine, and balcony. 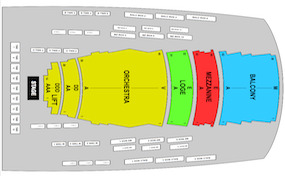 Pikes Peak Performing Arts Center Tickets have included Dave Chappelle, Rob Thomas, Ron White, The Producers, Jersey Boys, and Yanni. PikesPeak.CenterColoradoSprings.com is an independently owned and operated site that concentrates solely in the resale secondary marketplace. We are not currently affiliated with any venue, supplier, or official website. Prices on our sites tend to be above face value but can change quickly with market conditions. To order tickets for all Pikes Peak Center Colorado Springs events please follow the prompts online through the checkout or call our friendly staff at anytime.